Ever received a junk iMessage to an iPhone or iPad from someone you don’t know, or that is clearly spam? 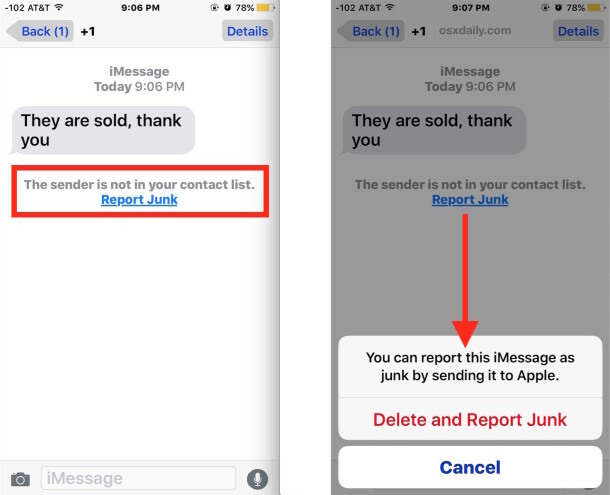 With new versions of the Messages app, there is a simple way to report the spammy iMessage sender as such to Apple, which helps them to detect and reduce junk bulk iMessages. Once confirmed, Messages app will back out of the junk message and return to the inbox. With the iMessage reported as spam and trashed, the message is removed from the iPhone, iPad, or iPod touch, and there shouldn’t be any need to have further interaction with the message. 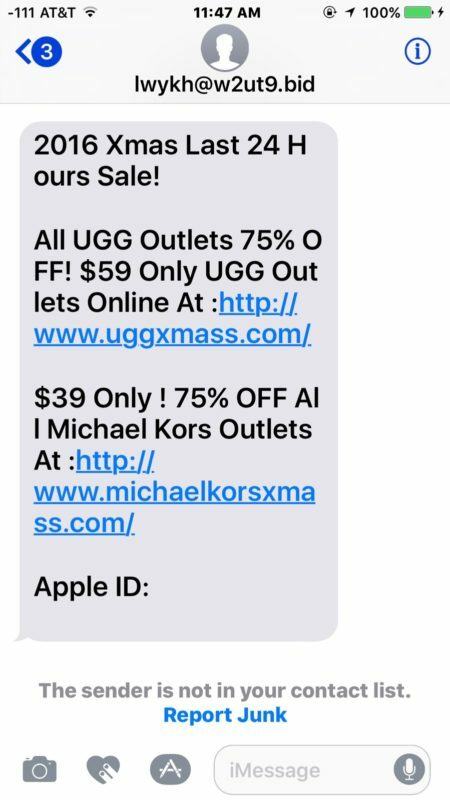 If you see these type of junk messages, be sure to report them to Apple as described above. It’s worth mentioning that once in a blue moon legitimate contacts can wind up with malware, adware, or junkware that attempts to solicit the iOS contacts list with messages to download apps or sign up for some junk service. That won’t necessarily arrive with a similar “report junk” option since it’s from a known contact, but if the sender is annoying anyway you can always choose to block the contact in iOS thereby preventing messages, FaceTime, and calls from that person, or just delete the message as they arrive. This option for reporting senders as junk is not available on the Mac, though you can block iMessages in Mac OS X which also carries over to iOS devices. Wow, maybe one day iMessage will grow up, and become a functional service like WhatsApp. How old are you? 12? Nice to see that they are trying to stop junk mail. How can you call Whatsapp grown up app more holes in it than a colander, and a door way to more junk and spam than the postman brings. I have been using WhatsApp since it was new. I have recieved perhaps a dozen spam. Also I can message any WhatsApp user. I am not limited to only those who forgot to shut off, or have no idea that they use iMessage. My brother and wife use Android. I use Apple for now. Unfortunately this doesn’t work at all for me as the text come in as iMessage and are grouped within contact and SMS and never in unknown. I get 4 to 6 spam a day and the number showing up is not even in service when I try to call it. I have been emailing photos to imessage.spam@apple.com. Any other solutions would help. While this article correctly points out the iPhone’s own function for reporting spam it doesn’t help solve the problem. Carriers will accept reports of spam and do pursue the senders. Copy any spam message that you receive and send it to 7726 (SPAM), a universally-recognized short code for reporting violations. You will get a message back asking you to respond with the sender’s info (either a phone number or, in many cases, an email address). Carriers will make note of this and if they receive repeated complaints will block the sender. Hi, I got a message from a person I do not wish to contact. Her number is not saved and when I got her message I just clicked it as a “junk”. Does it mean I will never be bothered by messages anymore? That all her messages are in nervana or do I have a junk folder now? And will she be also informed she is junk now or won’t she be aware of it and she will keep on messaging me? Thanks. What happens if I’m just trying to delete msgs from my iMessage and accidentally push delete and report this as junk when I didn’t want to do that?? I just wanted to clean up my messages but none of these people are junk and I accidentally hit that button. Will I still get messages from those people? Or did I F$@& something up?? If so, is there a way to reverse this? ?